Vog is Air Pollution produced by Volcanic activity. Volcanos can produce gases and acidic aerosols that contain Hydrogen Sulfides and acid forming Sulfur compounds. 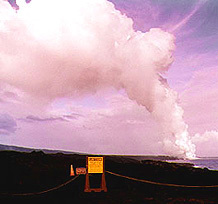 The Big Island is an active volcano. Diifferent phases of volcanic activity cause changing air quality. For some people Vog is a serious health challenge. Individuals may have a wide range of sensitivity to VOG. Exposure to Vog reduces the bodies natural abilities to expel toxins and it is important to reduce the exposure to other pollution sources such as burning rubbish, cigarette smoke and avoid over exertion during periods of exposure to Vog. Here are 10 suggestions of things you can do to reduce exposure, support your immune system, and reduce symptoms of VOG. Drink lots of fluids to loosen mucus and clear lungs. Hot tea may be especially good. Caffeinated teas contain theophyliine - a bronchial dilator, "Uncle Kimo" makes a Vog Tea specifically for relieving symptoms of Vog. Don't overexert yourself when VOG levels are high. Relax. As Vog seems to worsen during the day, it is best to do yard work or excercise earlier in the day. If practical, avoid high VOG areas during times of thick VOG. Avoid exposure to other air pollutants on the job and at home. Consult your doctor, or for more severe symptoms, a toxicologist or an industrial hygienist. Don't smoke and avoid people smoking or burning trash, especially during VOG episodes. Keep any respiratory and heart medications you use handy. Consult your doctor. Respirators or wet handkerchiefs may help if VOG levels are very high, but may hurt individuals with pre-existing respiratory or heart ailments, due to increased breathing resistance and, therefore, increased stress. Consult your doctor about your state of health, and consult an industrial hygienist about respirators. Know your baseline lung function. Take the tests after breathing "clean" air one week or more), then get retested if/when breathing becomes more difficult during high VOG episodes. Have your doctor keep records of both your lung function and approximate VOG levels. If you are considering a move to the Big Island, be aware of the VOG conditions which exist on different geographic locations on the island, The area from Kailua-Kona to Oceanview are "generally" the most heavily affected. Areas from Volcano Village to Hilo can also experience high levels of VOG. Wind direction and volcanic activity affect Vog levels. VOG "generally" worsens with altitude - sea level being better than higher altitudes - up to the 6000 ft. level. Above 6000 ft. VOG begins to diminish rapidly.